Well Care Orthopedic Program is the leading provider of home health and post-operative care for orthopedic patients in North Carolina. In preparation for your post-operative arrangements, we encourage you to contact one of our qualified Well Care Orthopedic Coordinators for additional information. We can discuss our services, answer questions on what to expect after your surgery and arrange services for your convenience. Physical therapists assess the patient's functional abilities and establish a rehabilitative plan with realistic goals. The physical therapist, in consultation with the physician, works with patients and families to establish home exercise programs to improve strength range of motion, endurance, gait training, mobility, and balance. The physical therapist may use modalities such as massage, heat and water, ultrasound, weights, peddlers, pulleys, electrical stimulation, specialized MIRE treatments or other devices intended to restore function, maximize performance or alleviate pain. Occupational therapy can help a person who is experiencing difficulty with a variety of functional problems. Dressing, bathing, shopping for food or personal items, and carrying out daily activities safely can be particularly challenging. Occupational therapy can also aid the person with more serious problems resulting from chronic conditions such as heart disease, cancer, arthritis, stoke, Parkinson's disease, and Multiple Sclerosis. Occupational therapists work with patients and their caregivers. The speech and language pathologist assists patients with disorders of communication, cognition, and swallowing. This includes the wide variety of problems people may have in language, speech, thinking skills, fluency, voice, social skills, and hearing. The speech and language pathologist offers specialized training for patients who have issues with swallowing. The speech and language pathologist focuses on the nature of the problem, the causes, and the impact on the patient. The speech and language pathologist, in consultation with the physician, works with patients and their families to establish home exercise programs and treatment plans that are targeted towards collectively determined goals. The speech and language pathologist may utilize specialized equipment for voice and language development, for nerve stimulation or for a bedside swallow study as part of the treatment plan. 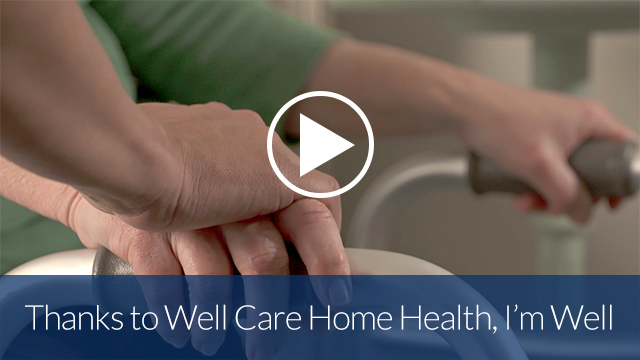 Meeting the challenges of care for a loved one at home can be very stressful. Well Care's Medical Social workers evaluate the social and emotional factors affecting ill and disabled individuals; provide counseling; assist patients and their family members identify available community resources; and coordinate a variety of services.